Space Utilisation Study for Your Office — Do You Want To Optimise Your Workspace? Office space is one of the largest investment that a company makes. In fact, it’s also one of the most difficult ones to manage. Today’s business leaders have to make sure that the space is used to its full potential. Otherwise, they stand to lose money. This has especially become difficult with the onset of mobility and remote employment. This is where a proper space utilisation study comes into play. Why Do You Need to Conduct a Space Utilisation Study for Your Office Space? Fail to plan right and you risk efficiency and productivity issues with your employees. If there is a lot of unused office space, then the company is losing money on maintenance, utilities, and property expenses. For your business to maximise profitability, efficiency, and productivity, your operations must fit the bill. This will increase productivity, improve revenue, and make your operations sustainable. HOW DO YOU TACKLE SPACE OPTIMISATION THEN? To begin with, you need to determine your office space occupancy and office space utilisation. This will, in turn, help you make the right decisions in terms of space requirements, budget, forecasts, and opportunities to cut costs. It will also help determine by whom, when, and how space is utilised. WHAT IS OFFICE SPACE OCCUPANCY? Office occupancy is the term used to describe the number of people in the office at a given time. Knowing this will help you know the space your business requires to support your staff. To find out how much space you need, consider the number of employees and how much space each will require depending on the nature of their job. WHAT IS OFFICE SPACE UTILISATION? The term refers to space usage, why it’s used and who uses it. It helps you establish priorities and purpose of space. It also helps you determine whether your office space is being used efficiently and whether future improvements are needed. Studies have shown that only a fraction of the staff is ever at the office at any given time. It’s therefore wise to optimise your space for an improved bottom line. According to recent research reports, in order for companies to foster innovation, they need to provide employees with spaces that focus on work and recreation. Workplaces now need to be designed for productivity. This means providing employees with spaces that cater to focus, rest, and the in-between. What look do you want your visitors to get when they visit your premises? Is flexibility at work important and does it contribute to how work is done? Will the office spaces be created be for a select few or involve all? What aspects of our current workspace behaviour do you need to change? Are there attributes of your current workspace you would love to maintain? Do employees regularly come to the office? If not, why is that? Involve your employees in the decision-making process since not doing so can affect productivity, their satisfaction, their engagement, the talent you attract, and your brand. Smart offices are designed to enhance employees’ performance. Employees are the ones who keep the company growing, so their performance is not something you should treat lightly. Whatever you design to encourage productivity must also enhance their health and wellness. Psychologists believe that the performance of human beings depends on their ability (can they do the work? ), motivation (do they want to do it?) and opportunity (do they have access to resources and amenities?). Ensure that the office space has the right combination of airflow, temperature, and humidity. This ensures the physical comfort of employees. It’s important to account for biophilia in your office space. The bond between humans and natural beauty is very strong. People love working in areas surrounded by nature. They also need to spend some time outside during the day and break away from fluorescent lighting. You can do this by providing enough natural light through windows and use of glass partitions. 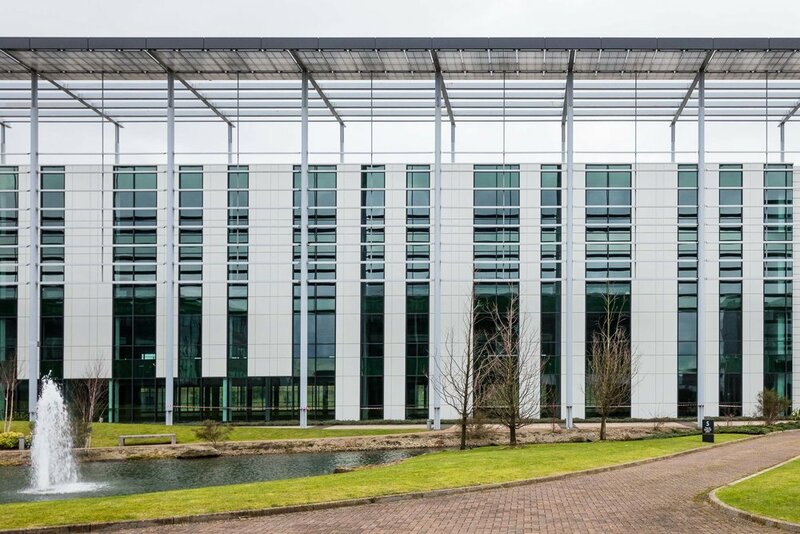 Have shared spaces with captivating or inspiring views and an outdoor area for employees. Include visual stimulations through window views and access to daylight. You can also use natural materials like plants, natural fibers, and wood. Others ideas include colours, graphics, patterns, art, and texture changes. Choose your colours wisely and strategically when designing different workspaces. For example, blue can be used for focus areas since it’s calming and it promotes clarity and mental control. Red is ideal for common rooms since it enhances strength and energy. Some employees thrive in noisy environments, while others dread them. This is why they should be able to control their noise environment. 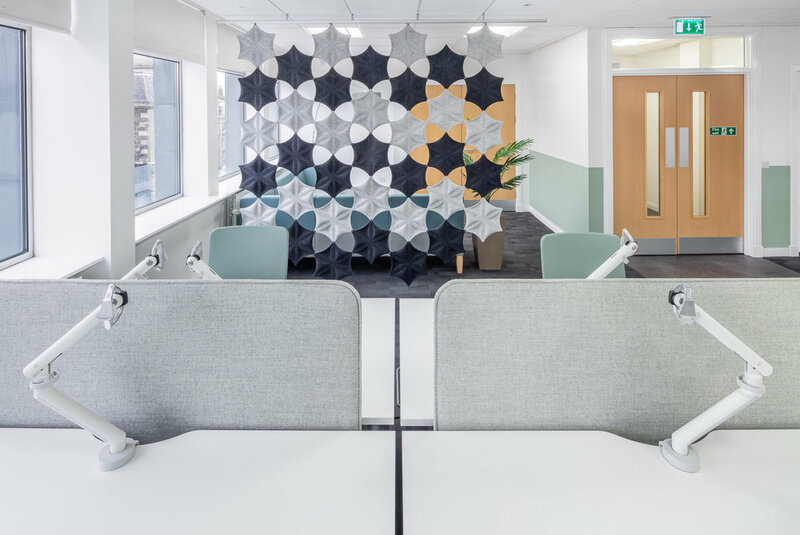 You can introduce noise absorption material when designing your office through use of acoustic fabrics, ceilings, and carpets. You can also block the noise using walls, partitions, acoustic screens, panels, office furniture, and more. Separate noisy places from quiet spaces and provide employees with headsets to keep out the unwanted noise. Giving employees adjustable furniture to prevent health problems. This also allows them to adjust their workspace to their needs. Ensuring your technology is efficient and seamlessly integrated. This allows for mobility and efficiency. Encouraging mobility by providing employees with technologies and tools that support it. Laptops and other mobile devices are a great start. Ensuring that your workspace has enough space for employees to move around. Adopt an agile working space where employees can choose their workplaces depending on their needs. Also, engage employees to ensure satisfaction, innovation, and productivity. Open sight lines encourages collaboration & communication. What kind of culture does your company have? Is it ruthlessly competitive, meticulously controlled and steady or entrepreneurial and flexible? This will help you decide what design to adopt. A cubicle culture emphasises control, conformity, and hierarchy. Employees are independently efficient and have to prioritise task completion. Creative space culture allows employees to collaborate and work together. The emphasis here is on communication, ideas, and innovation. The lines between departments and titles are also blurred. An influencing culture creates a balance between private spaces and open spaces. Space is dependent on task completion and whether the work is individual or collaborative. You can encourage an influencing culture by adopting the agile working space mode. The employees can choose where they want to work from and when depending on the activity they are handling. Choose open sight lines so that they can be encouraged to collaborate, communicate, and create. 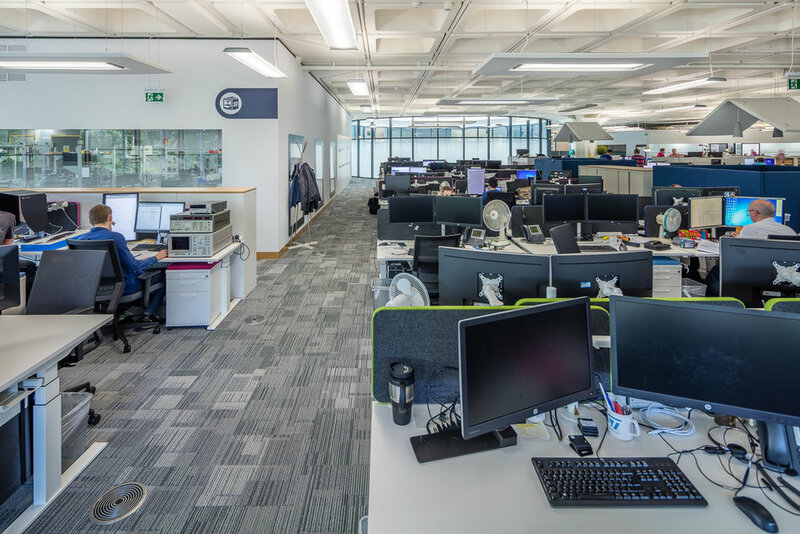 WHY DO COMPANIES NEED A SPACE UTILISATION STUDY AND HOW DOES IT HELP? All the above sounds great, but you don’t really know where to begin? No problem – this is where a space utilisation comes into play. Office spaces contribute to a high percentage of office expenses. Conducting an office space utilisation study helps a company determine if they are using the right premises and whether they need all the space they are currently using or not. The study gives you precise data and helps you scale office space correctly. The study is deigned to gather data on employee working habits. Their individual work, their collaboration, and their meetings. After the study, you have all the insights you need to decide whether change is necessary or not. This will also improve communication between personnel and management. Work profiles help you determine what kind of workstations you need. They help in planning space, knowing what IT requirements are needed where, and in understanding the remote working practices of employees. A space utilisation study also sheds light on how much time an individual employee spends in the office and when they spend it at their workstation. IotSpace has an Office Occupancy Measurement System that allows you to review the efficiency of your office space. It can also help you decide if you should adopt the agile working philosophy. IotSpace can help you save up to half the rent you are currently paying by optimising your space and providing the right insights into how your current space is actually used. 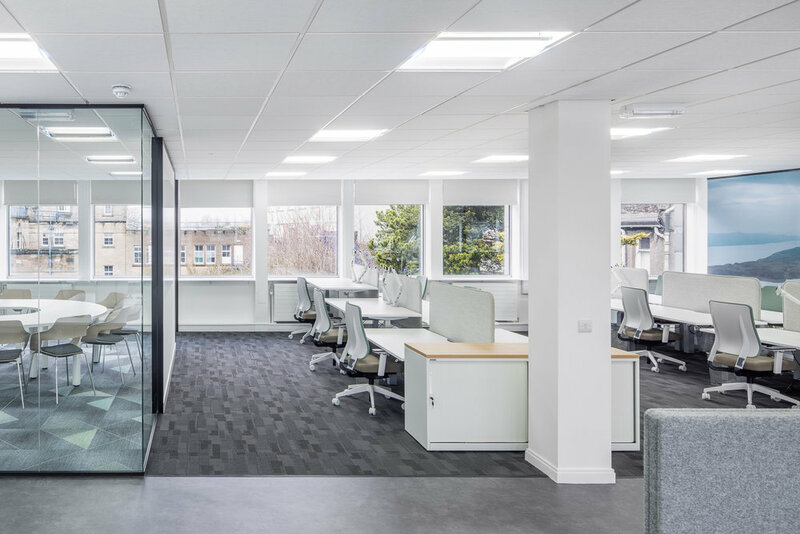 A space utilisation study will help you analyse whether you have managed to save on cost and whether the changes have improved employee working habits. You can use the results of the study to plan your future expansion or go even deeper with optimisation. Activity based working offices have designated areas for quiet working, shared workplaces, conference rooms, and break rooms. Employees choose their workspace depending on the tasks they are assigned. Measuring space utilisation helps identify areas that need change and areas that can be further developed. A space utilisation study can identifies the shortcomings of your office space setup. Consequently, it enables the company to correct certain situations before they affect the productivity of employees. Remote working has made it possible for people to work away from the office. The space utilisation study will help you recognise the days or months your personnel typically chooses to work remotely. This can help you in terms of saving energy since you can direct staff to use less space. You can then switch off lights and turn down the air conditioning in unused spaces. The workplace analysis helps the company collect data on work patterns, preferences, and communication methods. This information can help in strategic decision making that takes into account cost control, productivity and employee satisfaction. Adapting apps help a company integrate data on work activities with data from the study. These apps help employees find and book free workspaces, locate colleagues, and share information. Briefly put, they help improve work environments for both employees and employers. To begin with, you have to measure the actual use of space by recording and analysing the presence of employees. “Presence” means that the employee has actually used the workspace. This type of data can be collected through various methods including security systems, motion detectors, telephone systems, RFID, and sensors. The collected data is then compiled to show the actual use of space. This data clearly shows the cost of facilities and how much money is wasted through underutilisation. It helps identify underutilised workspaces, mobile workers, people who work at designed locations, and those who work in spaces unassigned spaces. All this info can then be used to determine how much shared space the organisation needs and how much dedicated space they require. IotSpace offers businesses a workplace consultancy service through the iotspot office space management system. IotSpot collects accurate data that reduces uncertainties about the workspace and increases availability. It makes agile working, better energy management, and better office space management a reality. Better yet, it allows you to review and enhance your business productivity and economic efficiency. It also offers insights that help businesses plan their maintenance, cleaning, architecture, and rental options. Agile working has become essential for businesses. A serious business has to understand the need to create workspaces that cater for different roles and tasks in the office. IotSpot makes this possible for organisations by helping them fully utilise their rented space. It also helps employees plan their working day through workspace reservations. They can see the availability of a workspace and book it. They can also find where co-workers are stationed for easy collaboration and information sharing. Conducting a space utilisation study for your office space is necessary if you plan on optimising your expenses. Doing this allows your organisation to take advantage of underused space and pool it into shareable workspaces that mobile workers can use. This helps you save your costs with real estate and energy. It also offers you the opportunity to hire more employees without having to expand your space. The key to a successful space utilisation study is accurate data. iotspot provides transparent, accurate, and sustainable data. This helps executives make informed decisions that, in turn, help maximise productivity and space usage. Do you want to save on real estate in Edinburgh and Glasgow? WHAT IS AGILE WORKING AND WHAT ARE ITS BENEFITS? Agile Working, what are users preferences?